Norfolk gives an impression of tranquillity, but smouldering beneath the surface is a history of dissent, upheaval and change. This county is a surprising hotbed of subversion. From the woman who challenged the might of the Roman Empire to the man who helped inspire and instigate the American Revolution, Norfolk's rebels have not only affected the county, but invariably the world. Fire In The Veins: Norfolk Rebels weaves them into a dark and violent, but vibrant tapestry of rebellion. 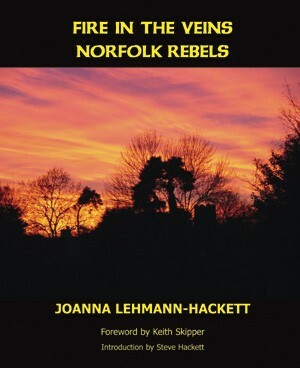 It tells the stories of Norfolk's rebels, from Boudica; through other famous Norfolk figures such as Elizabeth Fry and Thomas Paine, Robert Kett and Edith Cavell to some of Norfolk's most well-known modern day rebels, including radio presenter and author Keith Skipper who also wrote the book's foreword. Even Norfolk's most famous and revered son Horatio Nelson had a rebellious streak that is explored in this new and riveting publication. Many of these characters are linked and weaved into the vibrant tapestry of rebellion that is our inheritance. With nearly 100 images included, and a beautifully written introduction by Joanna's husband, former Genesis guitarist Steve Hackett, this book depicts the many fine men and women of Norfolk who through the centuries have defended their ways, as only Norfolk people can.